Would McIlroy, Westwood, Poulter & Kaymer benefit from return? Good news has been in short supply for Rory McIlroy this season. His absence from this week's Tour Championship is testament to that. But the decision to add the Scottish Open to his 2014 schedule is a welcome boost on all fronts. 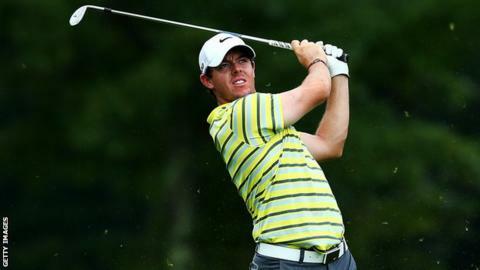 At a stroke the 24-year-old has bolstered his chances of contending for next year's Open title. The links of Royal Aberdeen offers an ideal tune up for Hoylake and there's far less chance of McIlroy arriving at Royal Liverpool "undercooked". Poor scheduling has been one of the key factors in his winless year so far. Too many barren weeks have contributed to a lack of momentum and a vicious, rather than virtuous, cycle of form. McIlroy's decision to play the Scottish Open and the Dubai Desert Classic next year could send an important message to prospective Ryder Cup team-mates. Too many of the continent's top stars have shunned the European Tour this year. And to what end? Ten of Europe's heroes at Medinah opted to play full time on the PGA Tour in 2013. Only Justin Rose, Sergio Garcia and Luke Donald have made it into the top 30 for this week's lucrative season finale. A year ago McIlroy was centre of attention at the Tour Championship after winning the PGA Championship and two events in the FedEx Cup play-off series. Now he's embarking on a lengthy break that has come a week earlier than he would have wanted. The difficulties of his change of clubs, problems with his management company and poor scheduling all contributed to him finishing only 50th on the Tour standings. Those factors suggest this will ultimately be seen as a blip year. But what of his other Medinah teammates? Lee Westwood thought moving full time to the United States would make all the difference. It didn't and it wasn't just his current bad back that left him languishing in 41st place. Fellow full-time American residents Ian Poulter and Graeme McDowell were outside the top 50, while Martin Kaymer was 84th. It didn't happen for Nicolas Colsaerts (128) or the injury-plagued Peter Hanson (127) either. All these players made their names in Europe. McDowell won his US Open straight after claiming the Wales Open title. Kaymer's 2010 PGA victory came when he won six European Tour titles in two years. Westwood wasn't a PGA Tour member when he went to the top of the world rankings. Poulter played seven times on the European Tour in 2008 before finishing second at the Open, which remains his best major finish. Yet the trend for so many of the continent's players is to cash in on European success by taking up playing rights in America. David Lynn made a decent fist of it, finishing 48th on the US money list in his debut season stateside, but remember it was as a Euro stalwart that he finished second to McIlroy at last year's PGA. Of course, there is more money and easier travel for those who base themselves in the US. It is very attractive compared with the globe-trotting required for a full schedule on the European circuit. Aside from the four majors and four World Golf Championship events (three of which are in the US) they are only required to find five more European Tour tournaments to satisfy membership demands. It is not an onerous task, especially as the Ryder Cup is also a counting event. So it's easy to see why so many of our top stars prefer to be full time on the PGA Tour and at best part-timers when it comes to their home circuit. European golf has struggled with the effects of the global economic woes compared with its American rivals. It is hard to see that trend changing. Only last week, 2011 Open champion Darren Clarke announced plans to commit to the PGA Tour next year. But if more top Europeans showed greater commitment to Europe it would be easier to attract bigger backing for the Tour. It is a classic chicken-and-egg scenario. That's why McIlroy's move is to be welcomed. It might encourage others to do more than the bare minimum for the Tour and continent they aim to represent in the Ryder Cup at Gleneagles next year. That date is 12 months hence and the more immediate priority for Rose, Donald and Garcia is the $10m (£6.3m) FedEx jackpot on offer at the end of this week. Rose, who is ninth on the standings, knows a win at the Tour Championship could prove enough to land the bumper cheque. The US Open champion is swinging well, was second here last year and feels ready to win again. Garcia (25th) and Donald (29th) would need other results to dramatically swing in their favour to claim maximum spoils. Each of the top five players on the list knows victory this week would guarantee them the $10m bonus. Tiger Woods leads the standings as he seeks his sixth win of the year, with Henrik Stenson lying second. Masters winner Adam Scott is third, Zach Johnson fourth and Matt Kuchar lies fifth. More than 20 of the 30-man field here in Atlanta are American. It's been a fine season for US golf. As for the Europeans, there is enough evidence to suggest shifting the emphasis of their schedules might not be a bad idea.